Launch of the TBM on Riyadh Metro. Having started work on two of the region’s most prestigious metro projects, Spanish environmental services, infrastructure and water company FCC Group can justifiably stake claim to have gained a foothold in this niche market. FCC Construction is leading the Fast Consortium which has won a $7.82-billion package covering three lines of the Riyadh Metro in the Saudi capital. The firm is also building a section of the Red Line of the Doha Metro in Qatar. 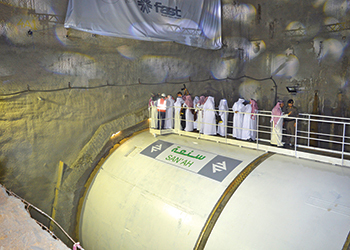 The Fast Consortium became the first of the groups working on the Riyadh Metro to start tunnelling works on the development when Riyadh Governor Prince Faisal bin Bandar bin Abdulaziz activated the first of the two tunnel boring machines (TBMs) that will be used to build the Green Line. The Green line will have 11 stations and two connections with the Blue and Red Lines. FCC is working on Doha Metro’s Red Line. This line forms a key part of the design-and-build contract for Package Three of the 176-km metro project secured by the consortium in July 2013. The package covers lines Four (Yellow), Five (Green) and Six (Purple) of the six-line metro network. After launching construction work on the project in 2014, the consortium has continued to make strong progress, with tunnelling work on the Green Line having started in May this year. Apart from FCC, the consortium includes leading companies from across the globe, including Samsung from South Korea, Alstom Transport from France, Strukton from the Netherlands, and Freyssinet from Saudi Arabia. The contract entails the construction of 64.3 km of metro tracks, 29.8 km of viaducts, 26.6 km of underground tracks and 8.2 km of surface tracks, as well as the design and construction of 25 stations and two depots and workshops for trains. In addition, 69 automatic and driverless trains will be supplied to provide service to the three lines. On March 19 this year, Fast Consortium placed the first 475-tonne concrete girder into its permanent elevated position – another first for Riyadh Metro, comments Jaime Freyre de Andrade, Fast consortium director, adding that this was an “important early step” in its journey towards delivering a world-class metro to the people of Riyadh. Construction works on the viaduct platforms on Line Four began in April. 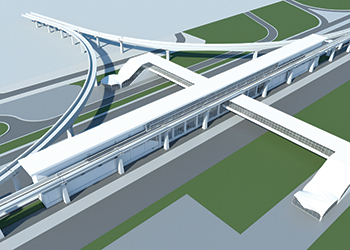 The line will connect King Khalid International Airport to the King Abdullah Financial District. 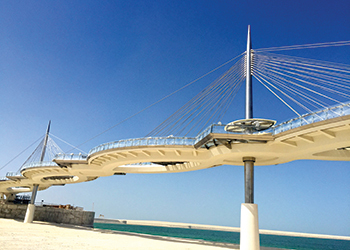 Lusail walkway ... an FCC project. “Although this part of the project represents a significant logistical challenge, the combined experience of the consortium will be used to reduce the impact of the works on the flow of traffic affected by the line,” he adds. The consortium will use two TBMs with a diameter of almost 10 m and which can excavate full tunnel sections for the three lines. The works will be conducted entirely underground using the EPD (earth pressure balance) method. It is estimated that the works will be completed in 2018 and Fast will use around 15,000 workers from more than 33 nationalities. Meanwhile, in Qatar, an FCC-led consortium is working on a €506-million ($551 million) contract from Qatar Railways Company to build a section of Doha Metro’s Red Line. The consortium also includes Citizen Services Group, Archirodon, Yüksel and Petroserv. The contract covers the construction of three elevated stations at Barwa village, Al Wakrah and Qatar Economic Zone; a 6.97-km section, as well as tunnellising the road at the entrance to Al Wakrah. The entire Doha metro network will have four lines with 98 stations over a total length of 354 km and is scheduled to be completed by 2019. FCC (Fomento de Construcciones y Contratas) is primarily engaged, together with its subsidiaries, in the construction and environmental services sector. It has extensive experience in the construction of metros, having already built a line in Panama, and Metro Line Two in Lima (Peru), as well as the metros of Toronto (Canada) and Bucharest (Romania), among others. 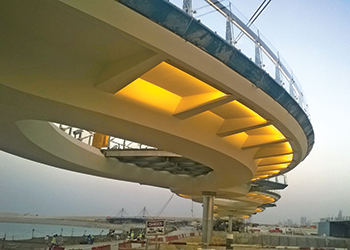 Lusail walkway ... being carried out by FCC in Qatar. The group has steadily increased its footprint in the Middle East through successful partnerships with governments and companies across the region. In Qatar, apart from the Doha Metro, FCC Construction is building two pedestrian walkways in the new city of Lusail. It has also completed Phase Two development of the Barzan camp residential area in Al Wajba, 15 km from the capital city. Meanwhile, the water management business in the FCC Group, FCC Aqualia, added another contract to its portfolio last month with the award of a three-year contract for the operation and maintenance of the wastewater treatment facilities in Hadda and Arana in Makkah, Saudi Arabia, worth €20 million ($22 million). The Spanish company has partnered Saudi Alkhorayef Water and Power Company to manage these facilities which will treat an average of 250,000 cu m per day of wastewater and a have a maximum capacity to treat 375,000 cu m.
FCC Aqualia has been operating since 2011 in Saudi Arabia where it has optimised Riyadh’s 6,000-km water supply network. “This was the first water management contract granted to a Spanish company in the Middle East,” the spokesman points out. In the UAE, FCC Aqualia has won contracts to operate and maintain the sewers and sewage treatment system in eastern Abu Dhabi. And in Qatar, it is responsible for the construction and operation of a wastewater treatment plant in Al Dhakiri, 60 km from Doha, which will meet the needs of more than 200,000 citizens. Globally, FCC has underlined its commitment to work and invest in Panama where it was recently awarded Metro Line Two, in the capital of the Central American country along with Brazil’s Odebrecht. FCC and Odebrecht have also built Line One. Under a €1.65-billion ($1.86 billion) deal awarded in May this year, FCC and Odebrecht partnership will see the construction of the new metro line, which will have 16 stations and 21 km of elevated rails and will benefit around half a million people in the eastern sector of Panama.